Quench your thirst and whet your appetite for action! Drink tickets let you keep order at the bar while fists fly in the ring. 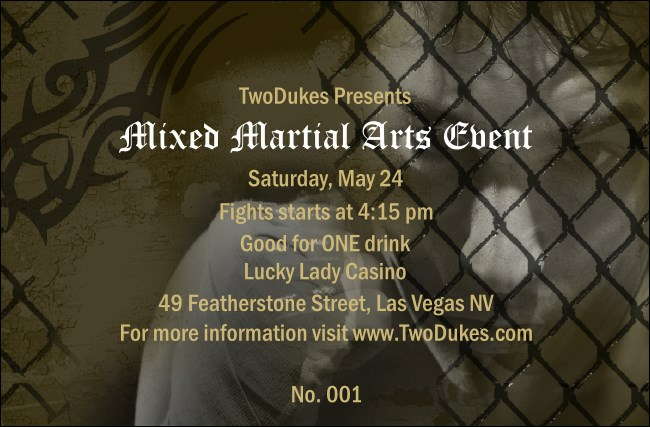 Featuring a fighter's face and fist with a chain link and tribal tattoo design, the Green Mixed Martial Arts Drink Ticket matches the rest of the event kit templates to keep you cool when the room gets hot. Knock one back with drink tickets for every event from TicketPrinting.com.